The fund shifting started under Governor Jennifer Granholm's administration as a one-time appropriation of $208 million to plug a hole in the budget created by the Great Recession. It was supposed to be paid back. The bill included language requiring funds to be repaid to the School Aid Fund to the General Fund between fiscal years 2011/12 and 2015/16. But the legislature never paid it back. Instead, starting with his first budget in 2012, Governor Snyder removed language requiring the funds to be repaid and made the appropriation a regular part of the state budget. The state took $400 million from the School Aid Fund that year, and cut per pupil school funding by $470, and that same year, the legislature passed a $1.6 billion tax cut that was only partially covered by increased individual income taxes. Peter Ruark is with the Michigan League for Public Policy. “There was a very large tax cut, $1.6 billion given to businesses the same year that we diverted money from public education. So we're paying for those tax cuts with money that is meant for public education,” says Ruark. The state has continued the appropriations every year since then, and is expected to take more than ever before in the coming budget year -- $908 million. Ruark says that in order to return schools to inflation-adjusted 2011 funding levels, the legislature will have to raise additional funds. That’s because its current budget is dependent on those appropriations. 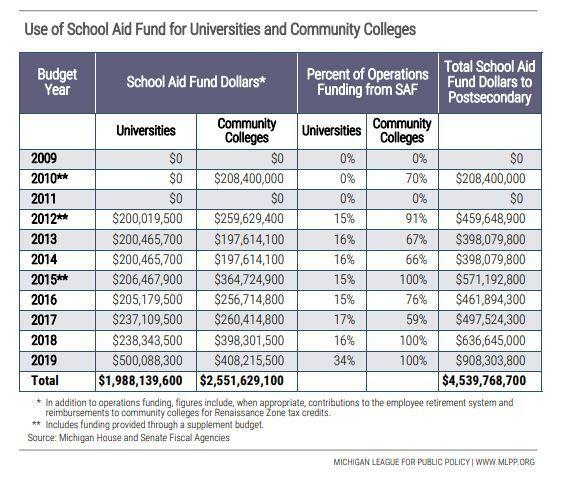 And even that wouldn’t be enough to meet the base level of $9,590 per pupil recommended by the Michigan School Finance Research Collaborative. The missing School Aid dollars, if restored, could also help to fully fund some other school programs like Early On, Michigan’s early intervention program for developmentally delayed infants and toddlers. The program is funded with $12.4 million each year in federal funds. Michigan has committed $5 million from the School Aid Fund for the program in 2019, but it would take $63 million in state funding dollars to fully serve all children who need intervention. Ruark noted that in 1994, voters passed a sales tax hike from 4% to 6% to fund public K-12 education. “Voters do agree with tax increases when they know it’s going to go to a good cause. To divert money from the school aid this way to ultimately pay for other tax cuts is kind of a broken promise to the taxpayers that voted for Proposal A back in 1994,” says Ruark. Some local school officials in Michigan would be OK with tapping the state’s School Aid Fund to help Detroit Public Schools pay down debt. That’s if they get some assurances. Gov. Rick Snyder’s proposal would tap the state’s School Aid Fund to pay for the measure. School leaders outside Detroit have balked at that idea – saying the plan shouldn’t come at the expense of every other Michigan student. The Legislature has approved budgets for the coming fiscal year. The K-12 schools budget was enthusiastically endorsed by Republicans and Democrats. Every school district in the state will see a funding bump of $70 to $140 per student under the new K-12 budget the Legislature just sent to Governor Rick Snyder.